Infinite Careers is a new collaboration between Global Education & Career Development (GECD) and the MIT Alumni Association that taps alumni to help students explore career paths and the non-linearity of career decision-making. To date, 15 alumni have accepted the invitation to speak about their academic and professional journeys. The group consists of alumni located all over the world, including Cambridge, New York, Washington, D.C., Philadelphia, San Francisco, and Jamaica. They represent 20 different MIT majors and minors and hold a wide variety of positions, including entrepreneurs, consultants, postdoctoral fellows, assistant professors, architects, pediatricians, social Impact investors, and legislative assistants, to name a few. In addition to participating in a speaking engagement, each alumnus completes a profile for the GECD website. The first events, which took place on October 23 and 24, featured Kerry Bowie (SB Course 1E ’94, MBA ’06) and Kevin Cedrone (Course 2 SM ’10, PHD ’13). There are three events scheduled for IAP: Khalea Ross Robinson (SB Course 1C ’11) on January 22; Ayanna Samuels (Course 16 SB ’05, MS ’05) on January 23; and Tarikh Campbell on January 24 (SB Course 10b ’09). 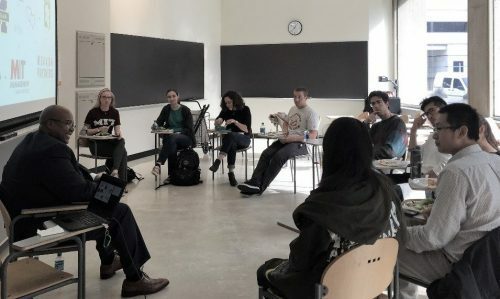 Events are held in a roundtable format and include up to 15 students, to foster a conversational environment where students and alumni can connect. The conversations and connections seem to be working: the first two speakers reported that students contacted them after the events.